Ready to Shine in 2018 - Rise of an IT Comapany | Huptech Web PVt. Ltd.
Do you think there is any such thing as ‘the moment has passed’, especially when it comes to sharing experiences? We don’t think so! Although we are past a week in 2018, we can’t help ourselves from delivering what a dazing year we had! Of course, it would have been phenomenal to chime in with the world at the stroke of the midnight hour but this hour is not bad either. So, for us, the moment has not yet passed and never will for this entire year. We pledged to stay as enthusiastic as anyone can be on the turning year which is why we think any hour is just as good as the first! Huptech Web has the most congenial working atmosphere that lets everyone find their motivation and comfort level. We have been rewarded with the most important commodity that any employee could want- freedom to make choices. Here we discovered that the trait of performing duties is aligned for a higher purpose- your own satisfaction. You all know the story of Huptech’s inception but it’s time we share how we have grown in all the possible dimensions in the past year. Our team has become stronger than ever with no communication gaps which have let us achieve the milestones we set for 2017. We’ll let the numbers speak!! When we stepped into 2017, we decided to celebrate every prime festival for the entire year, and we actually did! This was possible for us because it was a collective decision to wrap the day’s work before time so that the hours of celebration were hassle free and enjoyable. In terms of the growth in size, we took a huge leap. From just 3 employees in 2016, we became an official family of 17 in 2017. Not just our team, the number of projects have more than doubled in 2017. We handled around 80 projects in 2016 and advanced to more than 200 projects in 2017. Yes, it’s more than a 100% growth! With our projects and team constantly growing, our official space had to be changed. From a tiny 2-block office, we moved to a huge workspace on 30th August 2017. It was a fab celebration of growth! We can assure you that the development that we have witnessed in the past year is not limited to numerics. We have experimented with our skills as well. We started out relying on our expertise at Shopify and WordPress but 2017 was sincerely about growing. We made ourselves proficient at three new frameworks, Laravel, Drupal, and Magento. It is often a pre-judgment that where there’s magnification this big in terms of projects, client retention could be a weaker spot. Not in our case though! The rate of service reordering of Huptech is 70%, says so much about our work conduct! The trait of confidence, team management and effective communication is what we learned from Huptech Web. Our employment here was presented with open-door policy which accorded us with Equality, Pecuniary and Stability that allowed in developing a clear communication path. We share mutual respect, mutual reliance, and mutual benefits with Huptech Web. With just a flip in the calendar, not only the year changes, milestones do too. We were service providers and are going to improve by hundred folds in that niche, but for 2018, we have planned on venturing in product-based services. We are soon going to launch web-based products that will align with the requirements our existing e-commerce clients and help us cover even more ground in the market. While our 2018 objectives are a bit further in the future, we already have something cooking which is ready to be served. Huptech Web is all set to commence a new venture- Huptech Consultancy Services. With founders that ace in HR and staffing solutions, we have started rendering HR services across technical, pharmaceutical, BPO, hospitality, petroleum, etc. fronts. We assure you that maneuvering our HR services will be a surety of expansion, yes, very much like Huptech Web. Until our digital front is up, you can fire your HR queries right here! After working at our rightful positions in the SEO team of Huptech Web, we discovered that the corporate world is not as tough as it seemed. 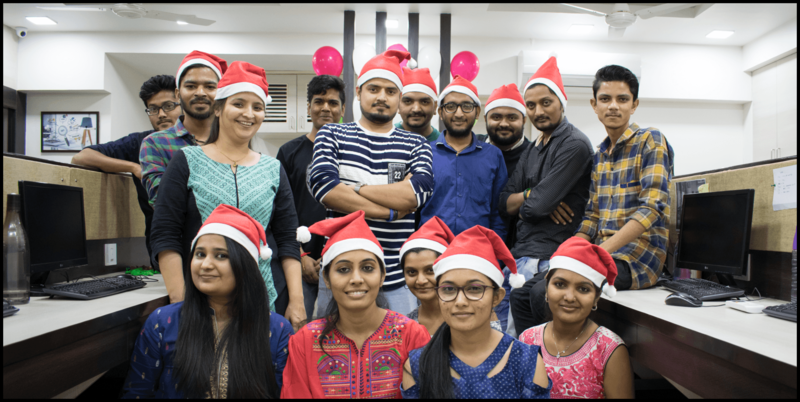 This company encourages each and every employee to dig their inner talents, be it fresher or an SEO expert, each of us has learned a ton of new things in our niche. And if there’s anything that can make us grow personally, then that’s knowledge, which we receive in abundance here. That was us, our 2017, and the vision of 2018! We are ready to roll into 2018 with all the more excitement and acceptance with a unified goal of marching towards our next milestone, together!